We know cleaning the lights in your home can be a tedious task, especially when it comes to your ceiling lights. Ceiling lighting gets as dirty as the other lighting fixtures in our homes, but since they’re difficult to clean, we tend to ignore them until they get out of hand. 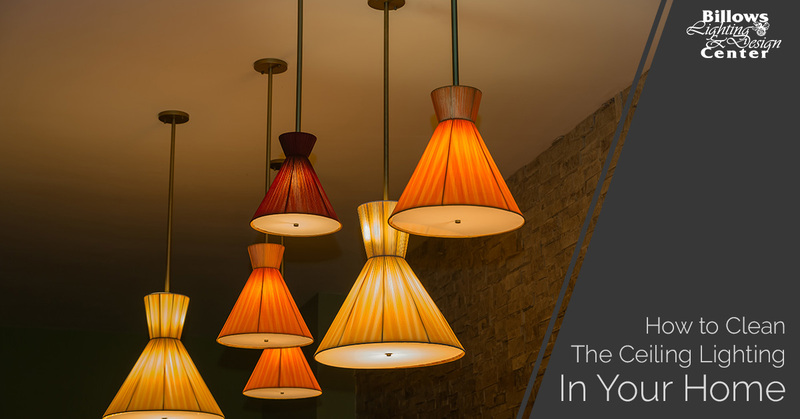 These types of lights are everywhere in our homes, too — in our kitchens, living rooms, dining rooms, bedrooms, you name it. Luckily, cleaning your home’s ceiling lights isn’t as intimidating as you might think. In this blog post, we’ll go over several steps you can take to bring your ceiling lighting’s natural glow back. At Billows Electric Supply Company in Berlin, New Jersey, we offer a large selection of lighting products for the interior and exterior of your home. If you’re cleaning your ceiling lights and notice it might be time to update them, contact our team of lighting experts today. In order to reach the ceiling lighting fixtures in your home, chances are, you’ll have to hop onto a ladder, step stool or scissor lift to reach them. This increases your risk of injury, no matter how careful you are. Take any necessary precautions before climbing these equipment tools, which might mean asking a friend or family members to help you during your cleaning process. Pro tip: Remember to turn off the power to the ceiling lights you decide to clean to prevent electrocution. You can simply turn the switch off, or to be extra careful, you can turn the power completely off through your home’s power breaker. Gather all your cleaning supplies before you start. You don’t want to realize you forgot to purchase any necessary cleaning supplies after you’ve already started cleaning. Stay ahead of the curve and make sure you have everything you need before you begin. Pro tip: Keep some tools on standby in case you need to take apart any of your lighting fixtures. Some good ones to have on hand are a Phillips screwdriver, a flat head screwdriver and extra light bulbs in case you need to replace any. Use the tools provided above to start cleaning your ceiling lights. You don’t want to only clean your lighting fixture frame, but also the actual light bulb itself. Pro tip: Take this time to see if there are any lights that are starting to dim or are approaching the end of their lifespans. Since you’re already up high cleaning your lights, you can take this time to replace any lights as necessary. After you’ve finished cleaning the ceiling lighting in the rooms in your home, you have to put everything back together to feel the full effect of your newly cleaned lighting. Reassemble any lighting fixtures you took apart while cleaning. If you don’t think you’ll remember how to this, write down the steps or take pictures. At Billows Electric Supply Company, our lighting experts know how integral your home’s ceiling lights are to providing efficient and beautiful illumination to your rooms. That’s why we’re trained and dedicated to helping you find the perfect ones — ones that will fit your home’s overall style while staying within your designated budget. Our Berlin showroom clocks in at 10,000 square feet and boasts more than 3,000 lighting items. If you’re in the area, we invite you to stop by to chat with one of our lighting experts face-to-face about your home lighting needs! For additional information, call us at (856) 281-1399 or fill out our online form. Don’t forget to sign up for our newsletter to receive store promotions and news about lighting trends.